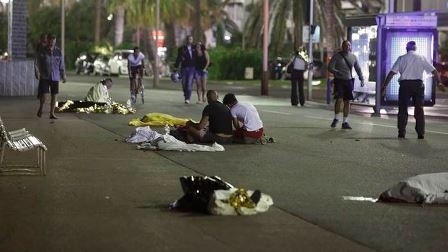 NICE, FRANCE (ANS – July 14, 2016) – In what appears to be another terror attack in France, at least 77 people were killed Thursday night when a large truck plowed through a crowd celebrating Bastille Day in the southern French city of Nice, the Nice prosecutor’s office said. CNN is reporting that the driver pointed his tractor-trailer into the crowd and accelerated, mowing bodies over. The driver was shot to death, authorities said. At least 100 people were injured, authorities said. • The attack in Nice, France, began when an occupant of the truck shot into the crowd and then drove for 2 kilometers [1.2 miles] along the pavement of the Boulevard des Anglais, the main street in Nice, regional President Christian Estrosi told CNN affiliate BFM-TV. He said police later found firearms, explosives and grenades in the truck. Eric Dartell was eating at a restaurant on the street where the incident happened. “You can see wreckage all along the way, a body, bicycles, street lamps and debris everywhere,” he said. The BBC says that Interior Ministry spokesman Pierre-Henry Brandet denied earlier reports of hostage situations and said the driver of the truck had been “neutralized.” He added that officials were investigating whether the driver acted alone. French President Francois Hollande was returning back to Paris for crisis talks in the capital, his office said. Mr Hollande was in the southern city of Avignon on a private visit. One eyewitness told BFM TV: “Everyone was calling run, run, run there’s an attack run, run, run. We heard some shots. We thought they were fireworks because it’s the 14th of July. Another witness, Roy Calley told the BBC that there were “thousands of people on the promenade” when the incident happened. US President Barack Obama had been briefed about the situation in Nice “and his national security team will update him, as appropriate,” National Security Council spokesman Ned Price said. Witness Ryan Hubbs said he encountered people on the street who’d lost multiple family members. They weren’t sure what to do but waited for authorities, though that was very difficult for them. Subprefect Sebastien Humbert, of the Alpes-Maritimes region, described the incident as a “major criminal attack,” according to AFP. Witness Tony Molina said he can see 70-100 emergency vehicles. Two helicopters have landed, he said. Bodies are covered in blue tarps and marked so emergency vehicles don’t run over them, he said. Photo: 1) The terror truck that killed so many people in the Nice attack. 2) Bodies are seen on the ground July 15, 2016 after at least 77 people were killed in Nice, France, when a truck ran into a crowd celebrating the Bastille Day national holiday July 14. (Source: Reuters/Eric Gaillard). 3) Police take over the promenade in Nice. 4)) Dan Wooding recording a radio show. 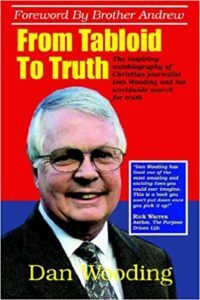 About the writer: Dan Wooding, 75, is an award-winning winning author, broadcaster and journalist who was born in Nigeria of British missionary parents, Alfred and Anne Wooding, who worked with the Sudan Interior Mission, now known as SIM. He now lives in Southern California with his wife Norma, to whom he has been married for some 53 years. They have two sons, Andrew and Peter, and six grandchildren who all live in the UK. Dan is the founder and international director of the ASSIST News Service (ANS), and is also the author of some 45 books. In addition, he has a radio program and two TV shows all based in Southern California.